The Taylor Family: Our Little Girl!!! 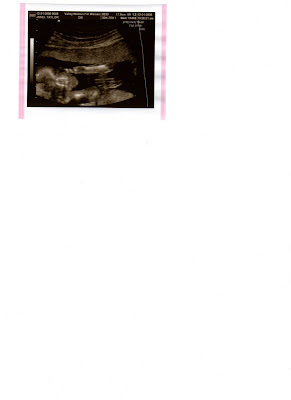 Ok so I am not exactly sure why when I scan pictures in it turns out bad, but I just wanted to show everyone our little girl!! I know it can be hard to decipher anything from these pictures, but this is a picture of her face with her little hands on each side. I know she is posing already. Derek and I were both excited to find out; that morning I had a little talk with the baby and told it that it needed to show mommy its parts so we would know what it is. In the ultrasound her legs were wide apart and gave us a very clear, reassuring view of a girl. After the ultrasound I cried, no surprise there. We were so happy that she is healthy and everything looks wonderful. They showed us her little hands and she has long skinny fingers just like Derek and I. Simply amazing the whole appointment was. Our little girl weighs 6 oz, and is in the 55 percentile. All of her organs are functioning great, it was fun to see the liver, kidneys, bladder, and stomach. I actually lost weight since my last appointment, which I have no idea how that happened over Christmas. Derek has also gained no sympathy weight with me. Tough love. If anyone has any ideas on how to drink a gallon of water a day I would love to here them. I have been trying to drink more water but I can only put down so much, and it is apparently not enough. Advice would be wonderful if anyone has any. Wah! Such a cute little picture. I'm sure she will be so cute and perfect. So fun, and I am so excited that I'll be there when she is born! As to drinking a gallon of water, I think it's impossible, but it helps to get those crystal light packs that you add to water bottles. They taste good and they are sugar free. (I'm not sure if that still counts as water technically, but hey that's how I attempted it!) I get to see you in 4 days! Wow, longest comment ever. Hee Hee, I found your blog! Love you! About the water...get one of those water bottles where you just fill it up once and it is the amount you need for the whole day. My bottle like that has been a life saver through out my pregnancies and nursing. yeah!! a girl, a little drama queen janel, how cute!! :) your pictures are so cute. funny your uncle is farther along then you are! ya, and i was noticing that last time you were here, you dont look pregnant at all. and you dont have much space to hide that baby in... what?? but atleast you know all is good with the ultrasound! she's one lucky girl to have been given you and derek for parents! LOVE IT!!!!! I am sooooooooooooo excited for you guys! I am so happy for you!!!! its crazy watching them do the ultra sound and seeing your baby moving, its awesome. im excited your having a girl.